Moving time: 4 hr 15 min. Wind: Calm for first 5 miles. Stiff 15 mph headwind for 50 miles. Variables breezes for rest of ride. Weather: 45°F (7°C) in the morning; got up to 85°F (29°C) by end of ride at 4:00pm. Mostly sunny. Where do they grow the potatoes? It was a cold, cold morning and I had flat front tire. Not a great way to start. The flat was caused by a piece of wire that punctured the tire and tube. I apparently picked it up yesterday and it leaked slowly overnight since I didn't notice it until today. I have no idea where these little wires come from but they seem to be the most common way tires are blown. I rode with Joe and Travis again today. 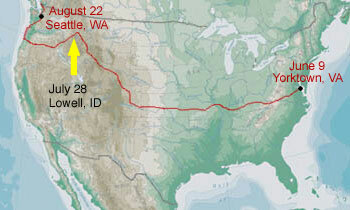 Joe and I stopped for the night in Lowell and Travis rode ahead to Kooskia since he is on a tighter schedule. 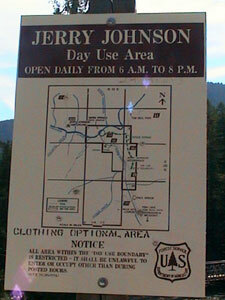 Our first stop of the day was the Jerry Johnson hot spring area. 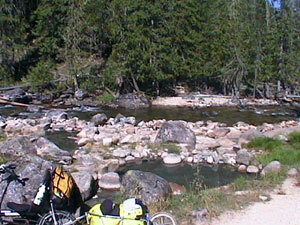 We rode our bikes along a one mile gravel trail that leads to the spring and had a dip. A guy on the trail told me that I could be fined for having my bike on the trail since it was a wilderness area. I told him that I was willing to take the chance. He retorted with "it's a philosophical issue, not just a legal issue." I find it amazing that some guy can tell me that I am making a huge impact on a hard packed gravel trail while he drove to the site in a Ford Excursion. It really peeves me when people think they only have to be concerned about our environment when they are in an area that has been set aside for recreation. Some guy was up in the woods with binoculars and a camera. Joe saw him and yelled up toward him - they guy seemed startled and went farther up the hill. He was obviously a peeping Tom. There are seven pool that are at perfect bath water temperature. Note the "Clothing optional area" note on the sign. The second shot shows two of the pools in the foreground and the river running in the distance. 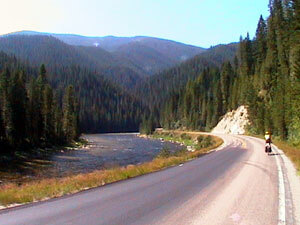 The route follows the Lochsa River from Powell to Lowell in the Bitterroot mountains of eastern Idaho. The valley walls are quite steep and there is usually no valley floor except for the river itself. In fact, the road (Route 12) was only completed in 1962 since it was considered impassable for over a century. I lost GPS reception for quite a few stretches due to the steep valley walls and lack of satellites near zenith. I may have trouble recreating the lost data. 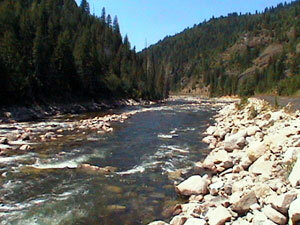 The river boasts four rapids of Class IV or better and has a nice mixture of flat water and white water. I saw a few people shooting the river in kayaks and four raft float groups. 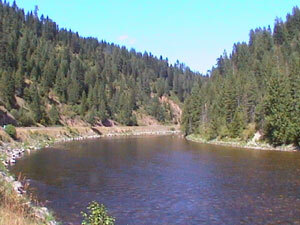 There are many creeks that run from the hillside into the river. The first picture shows Noseeum Creek. The second shot is of Travis riding along the river. They certainly don't grow potatoes around this part of the state. Perhaps we'll see some flatlands and farming within the next few days. The ride was completely downhill to Lowell but there was a particularly stiff headwind nearly the whole way. Joe and I planned to go to Kooskia with Travis but the headwind really beat us up so we stayed in Lowell. Travis continued on after we had dinner at the diner. We wished him well then got a room. There are only about six rooms all together here and the others were occupied by motorcyclists who were a very nice bunch of people. This plan allows us to break the next big climb into two days. We have to climb out of Kooskia (1200 ft. elevation) to 4300 feet of elevation within 40 miles. 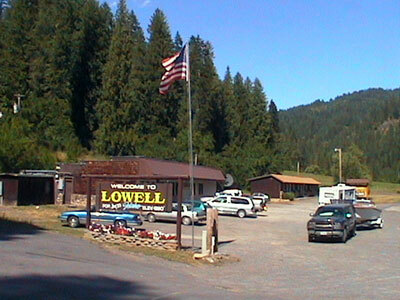 Lowell is a great little town located in the Locsha river valley. Actually, it's more like a gorge or canyon since the walls are so steep and there isn't a floodplain to speak of. My GPS satellite reception has been very poor due to the steep, tall canyon walls. Anyway, their welcome sign shows a population of 23 but the waitress in the cafe told us they have to change it since someone in town had a baby. The local economy is supported completely by tourism. There is a motel, cafe, and gas station with very limited groceries as well as a small fishing resort across a small bridge on the other side of the river. This was the only place with services since we passed Powell late in the day yesterday. It is the longest stretch without services on the route so far - 66 miles.